Windows, heating and cooling systems and air sealing and insulating systems are essential elements for building energy-efficient homes and providing customers with indoor air comfort. If a home's building envelope isn't properly sealed, it is difficult to prevent energy leaks. Through thermal bridging, a home's wall studs act as a passageway for heat and air to escape, reducing the insulating value of the entire wall and wasting energy when heating or cooling a home. In fact, according to the U.S. Department of Energy, air leakage can account for 30% or more of a home's heating and cooling energy. "Continuous wall insulation is crucial to fully seal a home's exterior and protect against heat loss," said Jerry Blais, vice president of marketing, Ply Gem siding group. "Insulated vinyl siding, which is backed with polystyrene foam to increase a wall system's R-value, is one solution that helps reduce the impact of thermal bridging, adding a blanket of insulation over the exposed wall studs." Due to its effectiveness, insulated vinyl siding now complies with energy codes and qualifies for energy programs. The International Energy Conservation Code (IECC) includes insulated siding among materials that can be used as insulation outside the building to provide the required R-values for buildings in the coldest climates. ENERGY STAR also now recognizes insulated siding as a material to reduce thermal bridging and meet checklist requirements of products that help homes qualify to earn the ENERGY STAR Qualified Homes label. 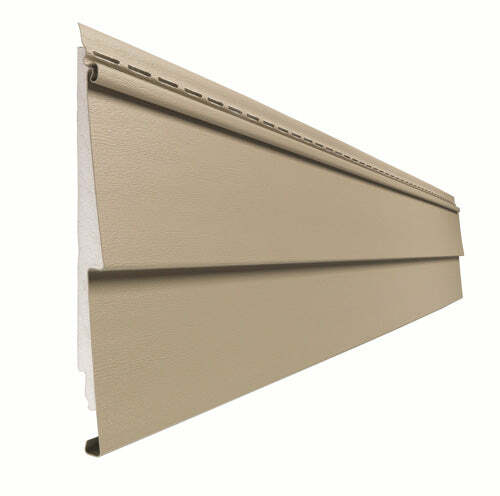 Vinyl insulated siding offers the look of real wood but does not require painting or staining. In addition, insulated vinyl siding acts as an exceptional dry wall system, making it resistant to mold growth and deterioration due to moisture absorption. The foam insulation backing and wide-style clapboard design makes insulated vinyl siding an extremely durable and impact-resistant cladding option that improves flatness on the exterior wall for added aesthetic appeal. With today's vast selection of profiles and advancements in color technology, builders can enhance exteriors with insulated vinyl siding colors that complement today's home trends. Blue, green or red colored siding provide "pop," which can make a significant improvement in the overall look of a home's exterior. Mastic Home Exteriors by Ply Gem Structure Home Insulation System is a premium insulated cladding option available in different lengths and extended color options to match various architectural styles. The product is enhanced with polystyrene foam insulation, which wraps the home's exterior envelope with a continuous blanket of insulation up to 1-1/4" thick. All panels have a true cedar grain and give the appearance of real wood siding, without the maintenance. Mastic Home Exteriors by Ply Gem products and other offerings from Ply Gem are a part of The Designed Exterior by Ply Gem, a complete exterior home solution from a single manufacturer – windows, siding, stone veneer, fence, rail, accessories and accents – with tools to help builders begin conversations with home owners and provide inspiration for architectural styling, color selection, and other exterior design specifications. For more inspiration, please visit www.plygem.com.